The Competition Commission review into the effect of News Corporation's proposed acquisition of BSkyB on media plurality cannot be paused until criminal investigations are complete and will take six months, according to culture secretary Jeremy Hunt. Speaking to the House of Commons this afternoon following a written statement on the proposed merger Hunt said he was not "legally allowed to put a pause in the process until any criminal investigation is over". Hunt told the House that the Competition Commission will be able to give a "full and exhaustive" consideration of the merger taking into account all relevant recent developments. Last week in response to increasing political and public opposition to Sunday red top News of the World News Corporation made the shock move of announcing the paper's closure. Yesterday's paper was the last in its 168-year history. Despite being unable to pause the process, Hunt said he will "take as much time as [he] needs" and after the Competition Commission reports in six months' time there will be a "period of discussion" to resolve the issue of whether News Corp is a "fit and proper" owner. Hunt had planned to make a different statement to the House on his decision to write to Ofcom and the Office of Fair Trading to ask them to reconsider the undertakings News Corp had offered in lieu of a referral to the CC in light of the revelations of the last week. However, the planned statement had to be scrapped after News Corporation made the shock move of withdrawing the undertakings, which centred on spinning off Sky News, 40 minutes before Hunt was due to speak in the House of Commons. 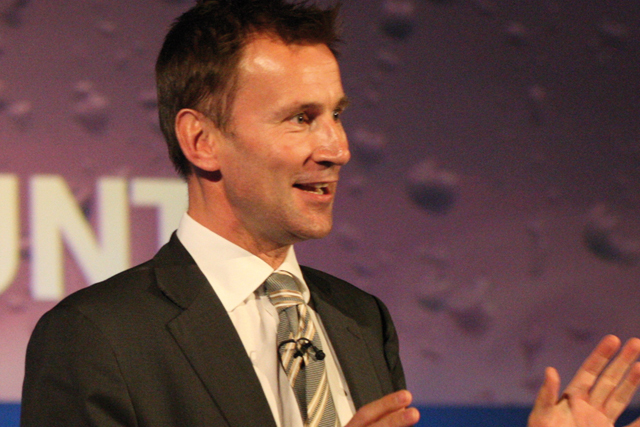 Hunt said: "On January 25th I said I was minded to refer News Corporation’s proposed merger with BSkyB to the Competition Commission in the absence of any specific undertakings in lieu. "As a result of News Corporation’s announcement this afternoon I am now going to refer this to the Competition Commission with immediate effect and will be writing to them this afternoon." Hunt said two inquiries will look into the situation. A full, judge-led, public inquiry into the original police investigation will leave "no stone" unturned, while a second separate inquiry will look into the "culture, the practices and the ethics of the British press". Prime Minster David Cameron was criticised by opposition MPs for not coming to the House to answer questions, despite having given a press conference on the scandal last Friday (8 July). Cameron was at a press conference on public service reform. Labour leader Ed Miliband said: "It is quite wrong that he chose to do a press conference about these issues but is unwilling to come to the house today. "The culture secretary has no direct responsibility for a judicial inquiry and the police but he has been left to carry the can by a prime minister who knows there are too many difficult questions to answer. It is an insult to the House and the British public." In response, a number of Conservative politicians, including Hunt, referred to Labour’s spin doctor Tom Baldwin, who is accused by Conservative Party deputy chairman Lord Ashcroft of "blagging" bank records. News Corporation first made the bid for the 60.9% of BSkyB it does not already own in June last year when it made a proposed offer of 700p a share, or £7.8bn. The independent directors of Sky rejected the offer but said Sky would co-operate with News Corp on the regulatory process and they would recommend an offer of 800p. Today's twist means the deal, if it eventually takes place, is unlikely to happen until 2012, at least 18 months after News Corp's first move. Sky today issued a short statement after the referral that it would "continue to engage with the regulatory process".